Glue The Moose - providing musical content creation services to music and sound equipment manufacturers since 1990 AD! Native Instruments “Vintage Organs” is a new instrument included in the latest update to their Komplete collection. 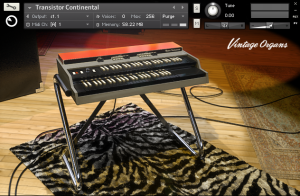 It’s a collection of five different organs: Hammond B3, C3 and M3 along with the Farfisa Compact and Vox Continental. I was asked to make two demos, one for the Hammond in a modern jazz/rock/funk style and the other with the transistor organs (Farfisa and “Connie”) in a modern sort of “Indietronica” style. I used the basic C3 for the Hammond demo. 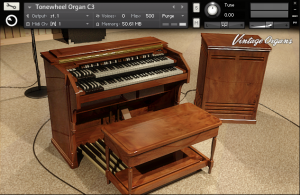 NI added some very cool and useful playability features to the organ. One thing I liked, that I wasn’t sure I’d like when I saw it, was aftertouch being mapped to the swell pedal. Apply a little pressure to a held key and it’s like you’re popping the pedal on a real Hammond. Pretty effective. I also liked the default mapping of the pitchbend wheel. It’s setup so if you push the wheel up, all partially pulled out drawbars come out proportionately. When you pull it down, all pulled out drawbars go in. So it lets one grab a handful of drawbars with the pitch wheel and “play” them…maybe even with a bit more control than you can on a real Hammond. You can hear this at the beginning of my demo. Finally, you can “store” all your settings for a particular organ on the registration keys (the reverse colored keys on the left side of the organ.) I used this effect in my demo during the middle section where I held a chord with my right hand and “played” the registration keys with my left to get a kind of filter sweep effect. All I used for the demo were a few Apple Loops, the factory acoustic bass from Kontakt and the Vintage Organ. All the distortion and reverb on the organ comes from the preset. It’s pretty gritty! I present to you, “Gordy and the Ball,” named after my dog, Gordy. OK, the sound may not be your thing but that is one of the coolest looking keyboard rigs I’ve seen. I’m not just saying that because of the rug either! If you go to a show and that’s what the keyboard player has setup, you know they’re gonna be playing something! I was only slightly familiar with the transistor organs and even less familiar with the whole “Indietronica” scene. But I did some listening and came up with a few themes. Of course, the theme that took the least amount of time to mess with turned out to be the best one. I didn’t even realize when I was playing it that it was in 13/8 but it seemed to work out. The transistor organ sound really ballsy to me; I think one could really make a guitar player cross with their aggressive sound. Like the Hammond, you can assign different sounds to the registration keys at the lower end of the keyboard. I think I used about five different settings for the Farfisa (on the left side) and three for the Continental (on the right side.) The “Connie” has this marvelous “roar” to it you can hear after the middle breakdown. Here’s “Juice on Hot Tea.” (a play on “ju san hatchi,” Japanese for “13 8″) Again, all the processing on the organs comes from the instrument itself. Copyright © 2010 gluethemoose. All Rights reserved.